Testing online tools that makes your life easier. Tired of guessing how many words or characters are in a string of text? One easy solution to this problem is a new online tool for calculating string length called strlength.com. Just input in a string of text, and it will calculate the precise number of characters, words, sentences and even paragraphs within that string. It is simple and intuitive to use, and best of all, it is completely free. All you have to do is type or paste in the string of characters that you would like to know more about, and instantaneously, this online tool will generate all the necessary information. As an added bonus, it will even calculate the storage size of the string (as calculated in bytes). There is one more aspect that makes it a powerful string length tool for editors, writers, and coders: all of the information that you enter is never used or stored for any reason. This makes strlength.com the tool of choice for anyone who is concerned about user privacy. Enter any text, on any topic, and never have to worry about that text being stored anywhere or shared with anyone. It could be the perfect string length solution for writers or editors who are trying to meet strict word count and character guidelines. For example, say that you have been asked to write a 200-word book review for a new literary journal – now you have a tool to make sure that you do not surpass that 200-word limit. Or say that you are a marketer trying to squeeze in a brief product description, but only have a limited amount of characters or words – you now have a tool to make sure that you are keeping to the right string length count. Also, think about the possible string length applications on social media – everywhere you go online, you are constantly being asked not to exceed a certain character limit (yes, Twitter, we’re talking about you!) or a certain word limit. With strlength.com, you will have a very convenient tool to make sure that you are adhering to all important guidelines and limits. And coders, too, can use it for calculating different inputs when writing code or for knowing the storage requirements for any amount of text. So how well does this tool work? We played around with it, using a variety of string lengths and word counts. And, each time, it returned the results immediately. Everything is clearly displayed, and even with long strings, the tool was able to return results immediately. Moreover, there are advanced options within the tool to reverse a string – or even to reverse a sentence or paragraph within the larger string. 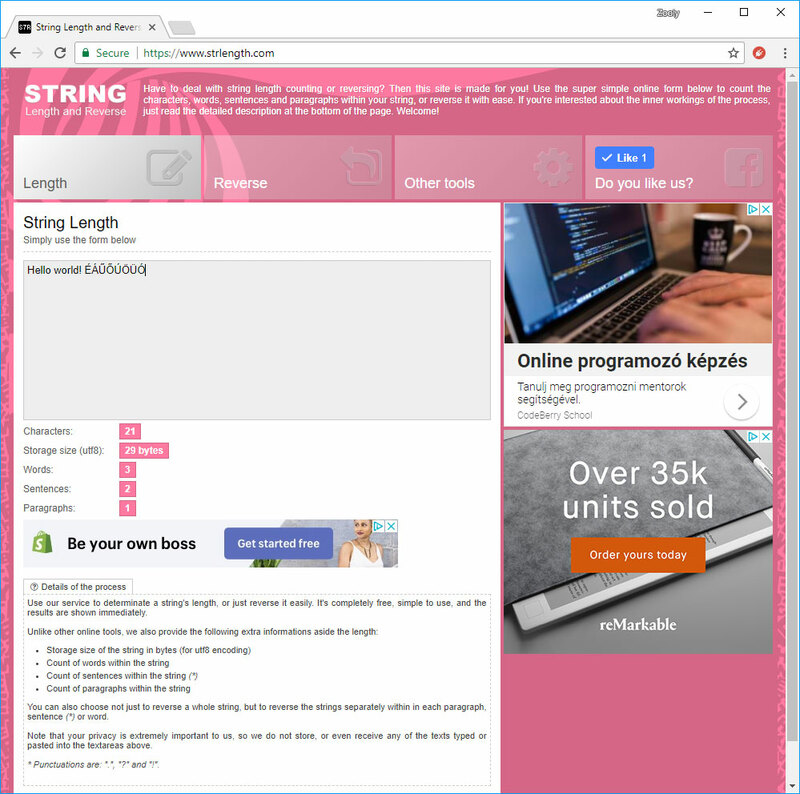 Based on the available features, the range of string length use cases that are possible, as well as the ease and simplicity of use, it is possible to recommend strlength.com for anyone – writers, editors, coders, social media users – who might need to know precise string length or word counts. Just type or paste in a string of characters, and you’ll have results instantly. Check out the tool via clicking HERE. 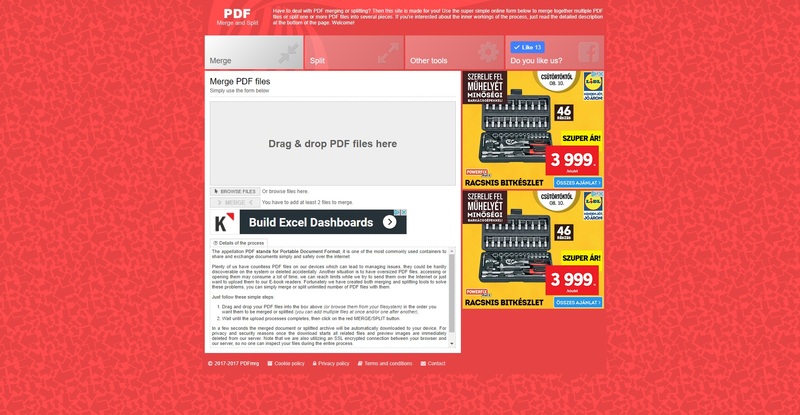 Had enough of huge PDF files? Don’t even know what’s in which file anymore? Loading takes forever and more? Ye, I know this feeling…however, I was lucky to stumble across a special website made exactly to remedy all of the above problems: https://www.pdfspl.com/! This is a super-easy site to use, just drag and drop (or browse it) the PDF file you wish to split up, press the “SPLIT” button and voila! One less problem. You can also set the number of pages inside splitted files. If you have trouble, check out the description below the buttons, but I doubt you’ll have any. …wait, you want to MERGE, not split? Good news: you can find the merging version of the site at the “Merge” section, also a lot of other web tools in the “Other tools” section. All of them of the same design, easy and simple! 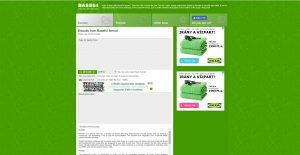 If you also approve of this site, don’t spare your PDF files anymore! We’ve got a lot of work to do! 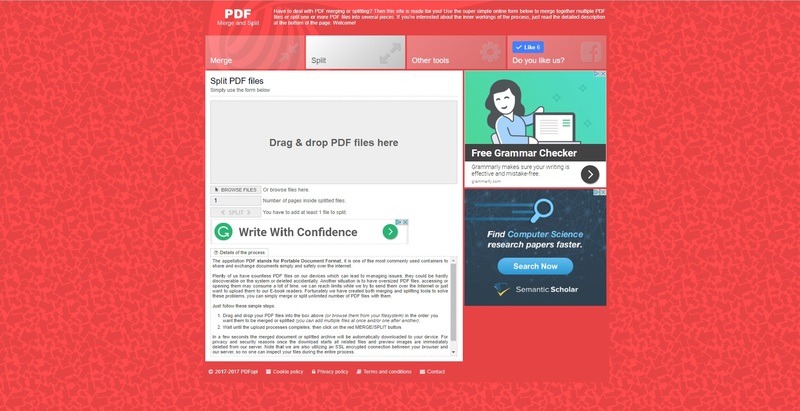 Developed to share computer documents like texts and images more easily, PDF (Portable Document Format) files are very common nowadays. As it spread, it became more and more difficult to manage all of them (oversize problems, user running into limitations, etc.). Luckily today our lives have became simplified thanks to websites like: https://www.pdfmrg.com/. And there it is! Simple, is it not? If you still have any questions, there’s a well-written description about the progress details. What’s more, you can also split PDF files just a click away, or use other web tools in a very similar fashion! The links are located just above the large box, you can’t miss it. Neat, isn’t it? Be sure to drop a Like if I didn’t disappoint you! Having trouble with URL decoding (or “Percent-decoding”)? Can’t find a site dedicated to it? Especially one that is easy to use? No need to look further, what you are looking for is: https://www.urldecoder.org/. 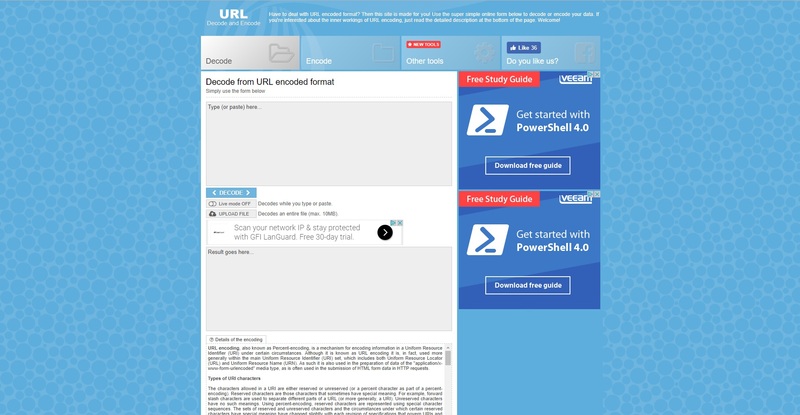 It works exactly the same way as its sister-site (https://www.urlencoder.org/), only that this one decodes the URL, but uses the same simple design, which makes it easy to handle for every user. There are also full-fledged details for almost everything, but the site is simple enough so it should be easy going. Just 2 textboxes and 3 buttons, use the latter to upload files, or for instant results, turn on the Live Mode. There’s also a whole list of URL chars used when encoding/decoding, if you’re not sure which char becomes what. Like the others, you may find other tools and sites for different things. They all use the same pattern, as shown in the picture below. I also use this site…why shouldn’t you? To make an URL portable it needs to be normalized into something that is universally understood, so different browsers will know what it’s made of, since it could be of any data (Latin-1, Unicode, etc). 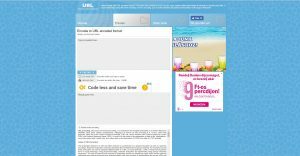 For those who have to encode URLs regularly, a site dedicated to it is a must. 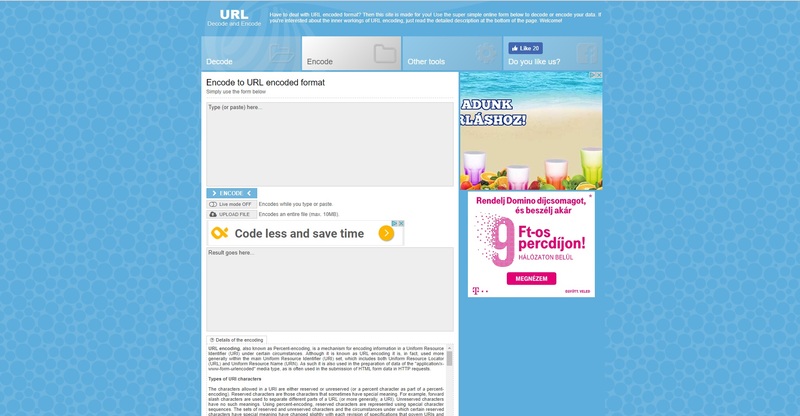 One such site is https://www.urlencoder.org/ (URL Encode). Its simple design makes it easy to handle for everyone: a textbox for the raw URL and another for the encoded version. There is a “Live mode” which immediately converts it into the encoded format. If it’s a file, you can upload it via the “UPLOAD FILE” button. If you need help, there’s a full explanation in the bottom of the page, including the definition, types of URI characters, reserved and undreserved chars, arbitrary data, binary data, character data, and even more! There is also a site for URL decoding, so if you have any to decode, check it out @ the “Other tools” tab. It’s just as great as this one. Trust me. Also, take this “Like”, you might need it. 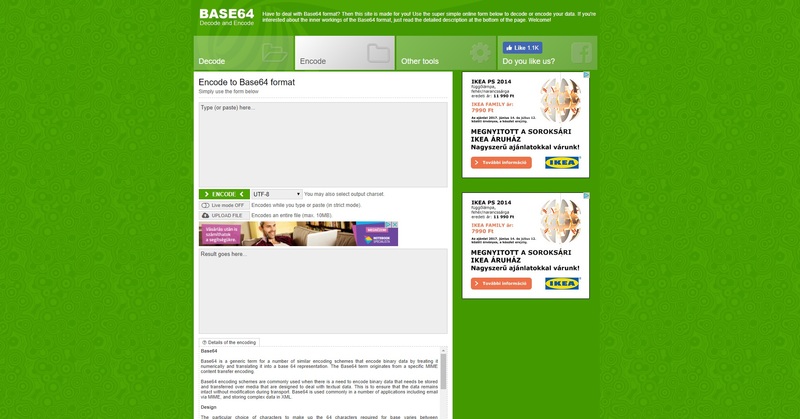 Ever needed a website that is simple, easy-to-use and designed for the Base64 scheme? 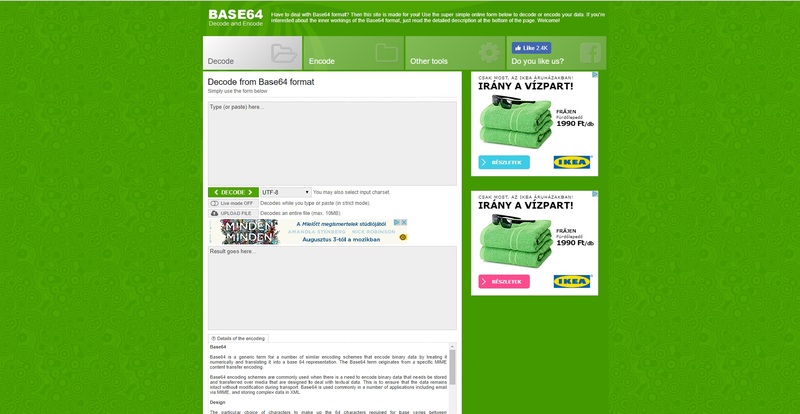 You just found it: Base64 Encode. This site really makes your job a lot easier, being able to encode any text to 8 different data type (UTF-8, ASCII, ISO-8859, Windows-1252 to name a few), by typing/pasting it or uploading the file, then pressing the “ENCODE” button. Or, by turning on “Live mode” to get the latest result, whichever suits you. Everything is self-explanatory: the upper textbox is used for the data waiting to be encoded, while the lower one shows the results. The green button is used to encode said data, while the others let you choose the output charset, turn on Live mode and upload a file. Below the second textbox one can find the details of encoding. It is the sister-site to Base64 Decode, which works the same way as this one, just reverse, and decodes data instead. Its layout is also the same. So back to the question – Use this site to encode or not? I think you should. Thanks to my work, I often come across encoding and decoding – most of the time with different schemes, but usually Base64. To make my life easier I needed a website that lets me quickly decode any data from said type to not only one, but many other if must. Wasn’t very lucky for a while, but then I found Base64 Decode. The site itself is simple, but great enough to get the job done: Two textboxes, the upper one for the data awaiting to get decoded, and the lower for the result. 8 different character sets: UTF-8, ASCII, CP1256, ISO-8859-1/2/6/15 and Windows-1252. You don’t even need to press the “DECODE” button every time, it’s enough to turn on the “Live mode” and you’ll always get the newest result. Works well with lots of files, no need to paste everything, just upload the file! It has a sister-site as well, the same but with encoding, so you don’t have to go too far for that either. Full explanation available, not that it really needs too much, everything is given. I also liked the layout, easy and simple. I’ve yet to find better, definitely left a “Like” there.